Cheese & Google. Best Inventions Ever? My friends were up to a lot of interesting things last weekend. For example, a number of my former coworkers are in New Orleans for a meeting, no doubt consuming beignets & copious amounts of liquor in their spare time. And many of my blogger friends attended PBandTuna: The Revenge, a party of epic proportions back in the District. That's right! The girl who formerly resided in a kitchenless apartment is slowly but surely learning to cook - or dying trying. I'm currently visiting my boyfriend in New Hampshire for the week, & he doesn't really know how to cook either, so we decided we'd try to be the Neelys together, except white & inept & attempting to make food with some semblance of healthfulness (read: less than three sticks of butter per meal). Kate, this isn't a cooking blog! I don't carrrre. Get back to doing whatchu do best: being judgy & taking photos of crazy people. 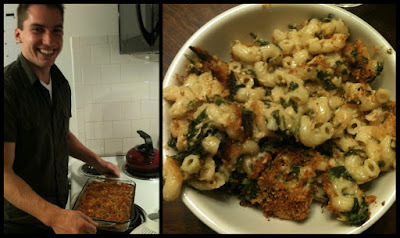 Kate, mac & cheese casserole cannot possibly fall into the aforementioned category of "some semblance of healthfulness." Because I love you, I'm going to share with you this heavenly recipe, obtained from EatingWell.com. 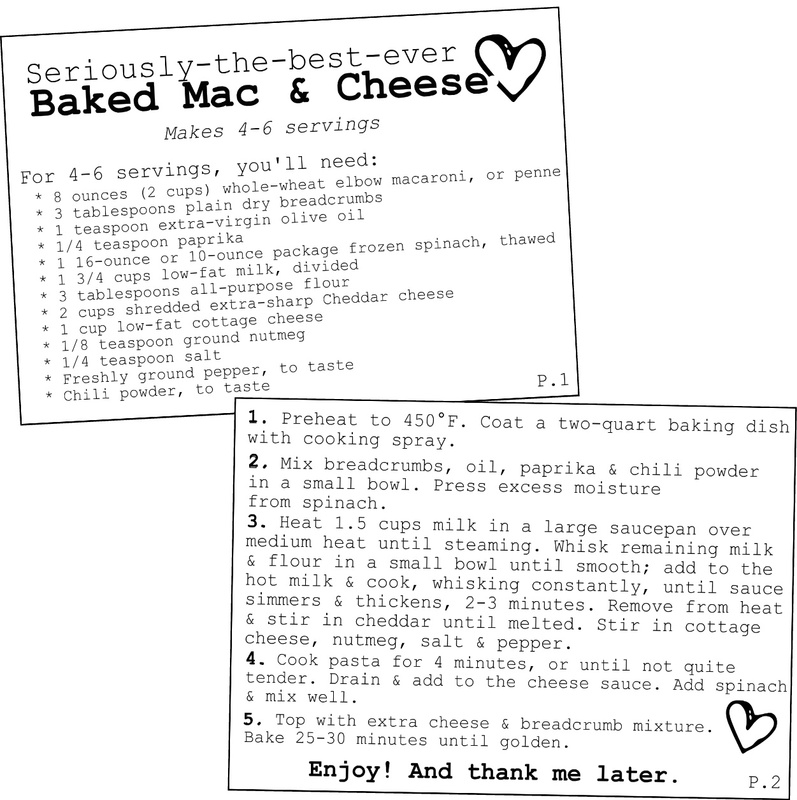 We changed the recipe up a bit, which I indicated below on the somewhat shoddy "recipe cards" I attempted to create. So... go forth & cook. Eat well & prosper! And please forgive me for the cards' inconsistent font sizes. Which you probably wouldn't even have noticed, but now you will. Shoot. Anyway, EAT WELL & PROSPER. What? You have recipes? Philistine!! Ha! That's actually a dish Eric an I like making together. Ours doesn't really have a recipe, but the secret (are you ready for this?) is using ritz crackers instead of bread crumbs on top! SO AMAZING. um, that looks AH-mazing. 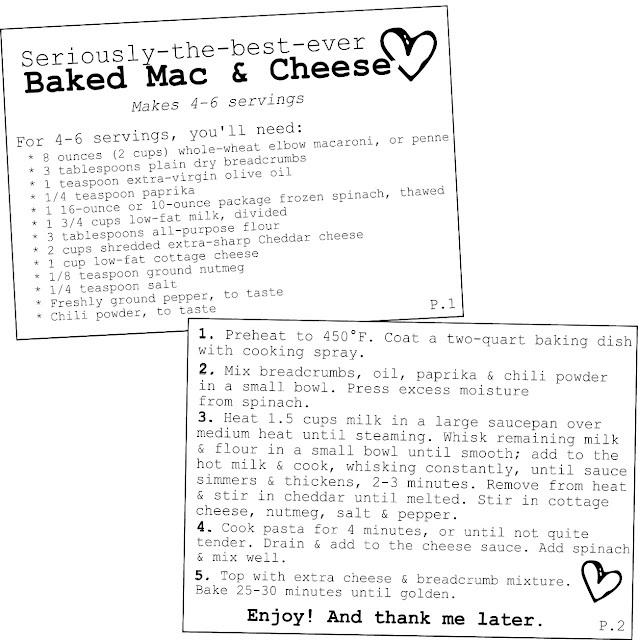 I have like a serious problem with mac and cheese, and now I am craving it for breakfast after seeing this post! I'll definitely try this recipe. It looks delicious!! 1. You're boyfriend is adorable! oh my goodness, this looks delicious!!!!! i am thanking you in advance b/c i am SOO going to make it!!! i love the idea of those recipe cards~!! did you get that template from a site somewhere or make it yourself? i wana do that on my recipe posts hehe!! I don't care how bad mac & cheese is for me, I'm never (EVER, EVER) giving it up. It should be it's own food group of deliciousness.